The Chairman of the Ekiti State chapter of the All Progressives Congress(APC), Chief Jide Awe, yesterday resumed office after over three years in exile, thanking the party’s State Working Committee(SWC) for not impeaching him during his travail. Awe, who was last week discharged and acquitted by the court due to the state government’s disposition to discontinue the case, praised Governor Ayodele Fayose for allowing common sense to prevail, saying this has made his stay in the ‘wilderness’ to be cut short . On the July 14 governorship election in the state, Awe said the State Executive Council (SEC) had sought the help of the National Working Committee(NWC) and the Zonal leadership of the party to intervene to be able to appeal to the 37 aspirants to allow civility after the primary. one Mr Ayo Jeje at Erinjiyan Ekiti in Ekiti West Local government prior to the 2014 governorship election. The State government subsequently declared him wanted with a N5 million price tag placed on him as a reward for whoever could facilitate his arrest. 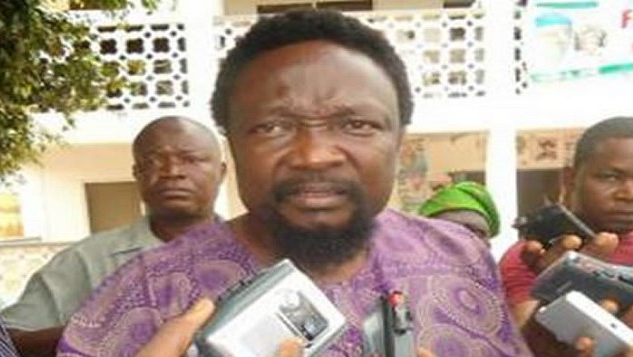 Speaking during a reception organized for him at the party’s secretariat in Ado Ekiti, Awe said he expected the worst during his time in the wilderness, thanking the party for being honourable enoughto tolerate him . He said he decided to thank Fayose for initiating a judicial process leading to his being discharged and acquitted, saying : “ If the governor wanted to prolong my stay outside the state, he would not have investigated the case and found that there was no evidence against me in this matter. subjects? This is unheard of and I will never be part of such”, Awe stated. Praising his party for standing by him , Awe said: “I expected my impeachment when I was away and impeachment is an ingredient of politics. But this party is populated by honourable people. “The executive members can read the constitution of our party and passed vote of no confidence in me, but they didn’t do this. “With this, you have spurred me into action to be able to do more. The people of Ekiti are yearning for APC. They have realized that the stomach infrastructure promised them was no longer forthcoming, so we must work hard and win the coming election. candidate, because not APC members alone are the ones to decide who win the election. “I want to warn our delegates not to collect money from aspirants, if you want to collect , let it be a legitimate offer. Awe said the party will conduct free, fair and credible primary that will appeal to all the aspirants and make them to back whoever emerges. aspirants. Whatever they will collect must be a collective and legitimate gift they can defend anywhere”, Awe advised.